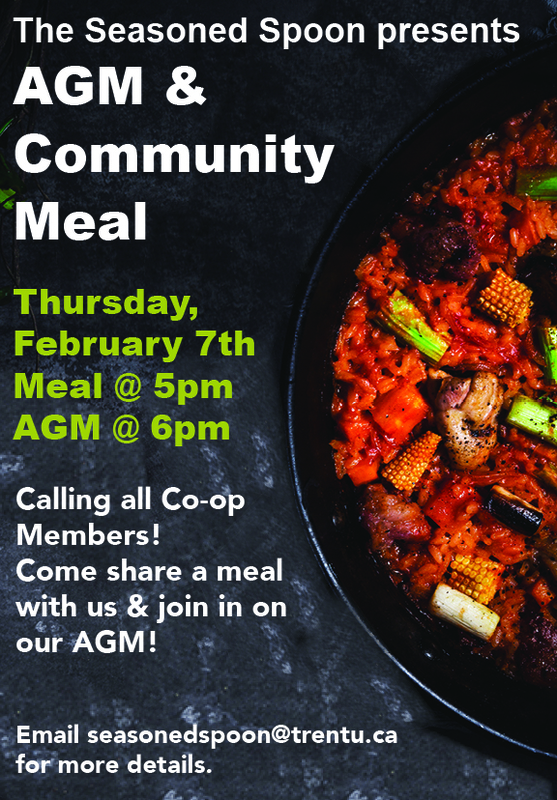 AGM & Community Meal - POSTPONED! Join the Seasoned Spoon Café for our first community meal of the semester PLUS our Annual General Meeting. This is a chance to share delicious campus grown foods with your fellow co-op members and find out how things work behind the scenes at the Spoon! As always, Seasoned Spoon community meals feature fresh campus grown foods and are open to everyone on a pay what you can basis. The AGM portion of the evening is for members only. Memberships can be purchased in the cafe. Visit our event listings or email seasonedspoon@trentu.ca for more info.